“Dear Julian, Thank you again for the splendid speech last Friday. It went perfectly from ‘take off’ to ‘landing’! I look forward to seeing you more frequently.” Lord Porter, Nobel Prize recipient, President of the Royal Society, Director of the Royal Institute. Nott was an experienced, entertaining and inspiring lecturer. Based in Southern California, he traveled the world to address general and business audiences, scientific specialists and aeronautic enthusiast. Be it a corporation’s sales force, a local ballooning club or an impressive gathering of world renowned scientific professionals, Nott customized lectures with thought provoking messages to suit most any audience. Nott’s illustrated lectures covered his extraordinary achievements and world breaking record flights. He discussed his work with Nasa’s Jet Propulsion Laboratory and their plans to use balloons in planetary exploration. He described his involvement with Google’s Project Loon a network of balloons traveling on the edge of space, designed to connect people in rural areas. And the future of near space travel as a senior advisor to World View, voyages in high altitude balloons. He presented the fascinating history of 220 years of balloons and their applications today. 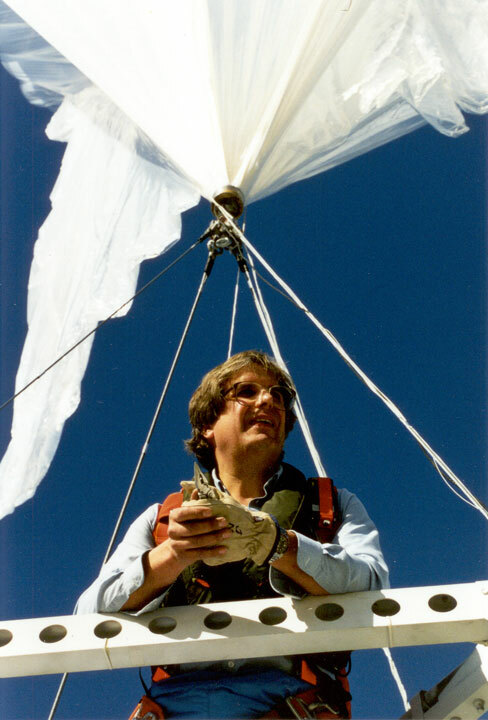 Nott developed a theory he coined Intellectual Courage and suggested ballooning was a microcosm of the history of science and technology. He theorized that there are lessons of intellectual courage to be learned, central to all major human advances, and particularly to scientists and the business community. Nott believed that this was a key to unlocking some of the reasons why we are able to accomplish great feats vs. failure.